Especially not after nearly a week of practice. Mullen made it clear Monday that Feleipe Franks, Kyle Trask and freshman Emory Jones have a long way to go to meet his lofty expectations. He said it might not happen this season or even next year. It was an indictment of what Mullen inherited when he replaced Jim McElwain last November and offered a less-than-ideal outlook on the upcoming season for those hoping the Gators would return to their glory days after eight years of offensive ineptitude. “To be a big-time quarterback, I don’t think they even think they’d know how hard that is,” Mullen said. “They should understand it by hopefully next summer. I was hoping maybe with just one of them it would really click, but I didn’t see that happen. But that doesn’t shock me. It might not even be next summer. It might be the summer after that. Mullen had hoped to find a starter long before the Sept. 1 season opener against Charleston Southern. Franks started eight games last season, completing 55 percent of his passes for 1,438 yards, with nine touchdowns and eight interceptions. The 6-foot-5 sophomore has ideal size and an NFL arm. But his accuracy and decision-making ability made him look lost at times in 2017. Backup Kyle Trask missed all of last season following foot surgery. Jones was one of Mullen’s top recruits in his first signing class. Mullen said the three have good attitudes and are making progress, but they also might need years to reach the level that Alex Smith, Chris Leak, Tim Tebow and Dak Prescott did under Mullen’s guidance. 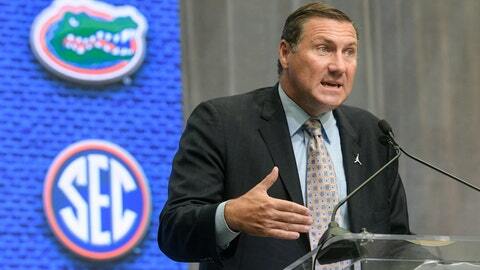 Mullen said he expects players, especially quarterbacks, to take big steps over the summer. QBs should be throwing with receivers and staying in the playbook. The Gators have had 12 starting quarterbacks since Tebow’s departure in 2010 — John Brantley, Jeff Driskel, Jacoby Brissett, Trey Burton, Tyler Murphy, Skyler Mornhinweg, Will Grier, Treon Harris, Luke Del Rio, Austin Appleby, Franks and Malik Zaire — and none has proven to be a long-term solution for the team’s long-standing problem. Florida has ranked no higher than 83rd in total offense since the 2009 season, and finished six of those eight years ranked in triple digits. Mullen was hired, in part, to fix the team’s anemic offense. Franks or Trask is likely to get the first shot at making it happen. Jones is expected to be a situational, change-of-pace backup. “I do feel like I’ve made strides,” Franks said. “And I think a big part has to do with just being more mature. When I first got here, I didn’t know how to adjust from high school to college, just joking around, thinking everything (was) ‘ho, ho’.